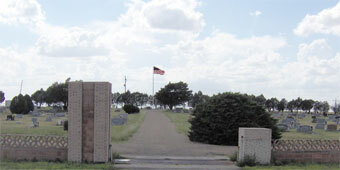 The Texas Historical Commission (THC) has designated Heart Cemetery as a Historic Texas Cemetery. The designation, reserved for cemeteries that are at least 50 years old and deemed worthy of preservation for their historic associations, means an Affidavit of Designation for Cemetery Purposes has been issued to the Heart Cemetery to and it has been recorded in the Lipscomb County Clerk's office. Cemeteries hold valuable historical information. They are often the last reminders of early settlements historical events, religious beliefs, lifestyles and genealogy. While the Historic Texas Cemetery designation encourages cemetery preservation, this designation cannot guarantee that a historic cemetery will not be destroyed. In some rural areas, historic cemeteries are threatened by the absence of fencing, which allows cattle and other grazing animals to topple and disturb headstones. Urban expansion and vandalism often threaten historic cemeteries. Sometimes these cemeteries gradually disappear, one headstone at a time: others disappear overnight. Cemeteries have also been the victims of vandalism and long-term deterioration from forces of nature, such as weathering and uncontrolled vegetation. Dorothy Schoenhals, the Lipscomb County Cemetery Chair person has stated that Lipscomb County is fortunate due to the support of the county governments and citizens that support the upkeep of our cemeteries. Ms. Schoenhals works with Ms. LaVaun Kraft and others in raising monies for Markers for unmarked graves or deteriorated markers in need of replacement. Ms. Schoenhals congratulated the City of Booker for seeking this designation and recognizes Ms. Lois J. Sheets in assisting her with the application by writing the history of the cemetery. The Heart Cemetery is the sixth cemetery in the county to achieve this designation. The Heart Cemetery was established on land given to the City of Booker in July, 1925. The land was given to the city by the Harry H. Mitchell family. The city council appointed W.O. Nichols on April 6, 1926 to oversee the building of a sanitary house and tool building at the cemetery. A Board of Directors was appointed in 1927 and the cemetery was officially dedicated on October 24, 1929. Any individual or organization is eligible to submit an application for this designation. For more information, or to receive an application for the Historic Texas Cemetery designation, call (512)475-4167. The Texas Historical Commission is the state agency for historic preservation. The agency administers a variety of programs to preserve the archeological, historical and cultural resources of Texas. See www.thc.state.tx.us for further information.